As airlines seek every opportunity to reduce weight, differentiate their brands, minimise costs and enhance their customers’ flying experiences, they need versatile materials, creative design options and global support from suppliers who understand the desired outcomes. At Aircraft Interiors Expo Hamburg Sabic’s Innovative Plastics business showcased a number of new and inspiring offerings that are helping aircraft customers meet regulatory requirements and OEM standards, enhance safety and sustainability, and optimise the passenger experience. These include a range of high performance engineering thermoplastics in a number of forms – resin, sheet, film, foam and fibre – that are compatible with a range of processing techniques such as injection moulding, thermoforming, and additive and composite manufacturing. Beyond material solutions that are lightweight and compliant, Sabic highlighted two services that can help its customers achieve their commercial objectives: the company’s global application development resource, which helps customers design parts and systems with an eye toward weight-out and cost-savings; and customised colour and aesthetic services, including colour management throughout a customer’s global supply chain. "Our customers have told us that they are interested in a total solution that goes beyond providing a material," Kim Choate, market director, Mass Transportation for Sabic’s Innovative Plastics business, says. "Historically, this has been our approach – to look at each customer’s need, and bring our years of global experience – including solutions that have worked for other industries – to the table." Aircraft interior designers are often restricted by the clarity and compliance limitations of the transparent materials currently available to them. Sabic’s booth featured important expansions of its industry-leading Lexan sheet portfolio, Clear Lexan XHR2000 sheet, available in uncoated and one- or two-side coated options. 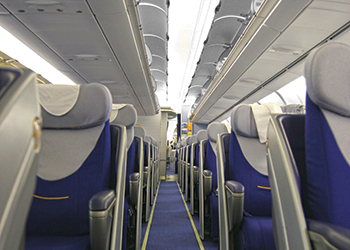 These materials have been named a Crystal Cabin Award Finalist in the category of Materials & Components. Uncoated, Clear Lexan XHR2000 offers 80 per cent light transmission – the highest level of light transmission available in an OSU-compliant sheet material today which meets OSU 65/65 heat release and typical industry flame, smoke, toxicity (FST) requirements (FAR25.853, BSS7239, ABD0031). Robust vertical burn performance is possible with the use of a post-secondary process, such as a functional coating or laminated film, which adds further design flexibility, chemical resistance and scratch resistance properties. By contrast, Clear Lexan XHR2HC1 and Lexan XHR2HC2 sheets are one- or two-sided hard coated sheet options that – because of their coating – meet the industry’s robust 60 second vertical burn performance, smoke density OSU 65/65 heat release standards, and OEM toxicity requirements. • A 3D printed economy class seat prototype using filament made from Sabic’s Ultem 9085 resin. To inspire seating tiers to take a fresh look at seat design and fabrication, Sabic licensed the Studio Gavari design for a sleek and ergonomically advanced seat. The seat was printed by Stratasys, using Sabic’s Ultem 9085 resin. Ultem 9085 resin is highly compatible with 3D printing.